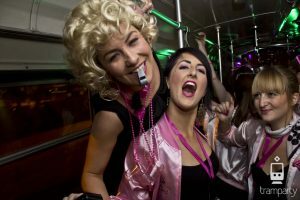 TRAM PARTY » About Us » Hen party in Krakow? You can organise a special private hen party in a tram. No, not in a regular tram, we’re talking about a club-on-wheels 🙂 A club which will take you for a stunning journey around the city with music blasting from the speakers and laser lights beaming on board. Take your crew for 2,5 hours (or more*) of the craziest party in Krakow! Let us organise the best hen party you could ever imagine.